Designed by Philips, one of the world's largest electronics companies, the Senseo® Coffee Machine brings great taste – in both design and coffee – to your kitchen. The patented system uses perfectly balanced proportions of coffee and water. Mild pressure and a special spray head produce an optimally balanced coffee-filtering process. If your a regular reader, you know I am a coffee FANATIC! I've always had a love for coffee, however the love deepened after I had children.......for coffee now has an all too important purpose; to keep me awake and moving! While I brew a pot of coffee first thing in the morning, I also like the occasional cup throughout the day (or at night for that extra burst of energy to blog ;). The Senseo Original Coffee Machine does just the trick for those moments when you just need one cup of coffee, and not an entire pot. Simply insert the Senseo Pod of coffee (available in many different flavors) place your favorite mug on the stand of the Senseo ... push a button; and in the matter of a few seconds you have a perfect cup of coffee! Coffee House runs in the middle of the day (or night) no longer required! Do you want coffee on command?! 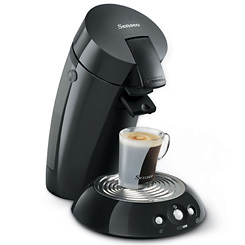 One Lucky Reader will receive a Senseo Original Coffee Machine! Leave a comment~ Visit http://www.senseostore.com/ and let me know which Senseo Coffee Flavor your most excited to try. The comment is considered your entry. Entry to this giveaway ends at 12pm PST November 25, 2010. Winner's are chosen randomly through random.org. The winner will be announced in a post within 7 days of the giveaway ending, and contacted through email. The winner will have 48 hrs. to respond or another winner will be chosen. I would like to try the Senseo Coffee Pods - Vienna: Hazelnut Waltz. I'd like to try Senseo® Coffee Pods - Paris: French Vanilla. I'd be anxious to try the Kona Blend. I'm a coffee lover. Drink it constantly day & night so this coffee machine whould be put to good use. I would love to try the Paris: French Vanilla flavored pods! I would love to try the Breakfast Blend! I'm excited to try their espresso flavor! I would like to try the Kona blend, thanks! Thanks for saying hi on MBC! I'm like your 1 millionth follower now! :) You have quite the fans Mrs. Pro Blogger. Their Breakfast Blend flavor caught my eye! 2)Subscribed to the blog RSS google feed. 3)Subscribed to the blog RSS google feed. 4)Subscribed to the blog RSS google feed. 5)Subscribed to the blog RSS google feed. I love this giveaway! I think I'd be the most excited to try the Vienna Hazelnut Waltz.